« I’m Off to See the Wizard! I actually drew it, and I’m pretty proud of it, considering what a crappy job I do drawing pretty much anything. Obviously, this was the one I’ve been plotting. Number two is the sudden inspiration. As you may remember, I went to see “Wicked” over Memorial Day weekend. It was a really, really amazing experience. I’ve collected Wizard of Oz stuff since high school, and I’ve always loved the movie. When I found out about Wicked (the book), I HAD to read it. I loved it (although I know it’s not for everyone). When I heard about the musical, I was thrilled. I bought the cd as soon as it was released, and I’ve had it memorized since not long after that. The song “Defying Gravity” has always spoken to me. I am THRILLED with both of them. I got them at Jinx Proof Tattoos in Georgetown, which was also where I went to get my nose pierced almost two years ago. It’s a great shop, and I had a terrific experience with Tim, who did my work today. He’s REALLY nice, very friendly, and made me feel really comfortable. There is very possibly a #6 in my future, and I’d go back to him in a hearbeat. June 1st, 2009 | Tags: tattoos | Category: Misc. What will #6 be, perchance? AWESOME!! 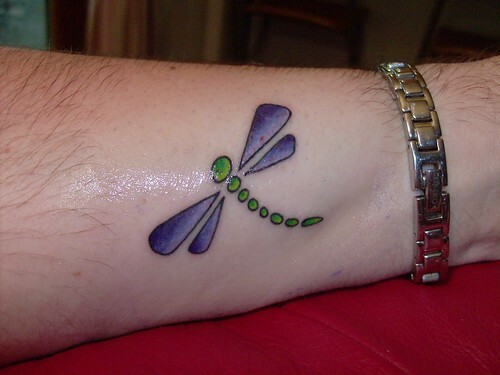 I love that dragonfly. It is too cute! Love them both. I love the fact that the defy gravity one is right side up for everyone else, but when you look at it, it’s upside down. Perfect! They look great! I got two this year as well (up to 5 myself) and it’s nice to hear of a new place. I had my first at Great Southern in College Park, and the other two at Dragon Moon in Glen Burnie. I love Dragon Moon, but it’s kind of out there unless you’re going to the airport. You are one brave chica! Very, very cute. Wow I’m impressed with two at a time!!! Love the dragonfly! Very nice! The dragonfly is adorable, nonsense that you can’t draw! Ooooh!! I love the dragonfly! 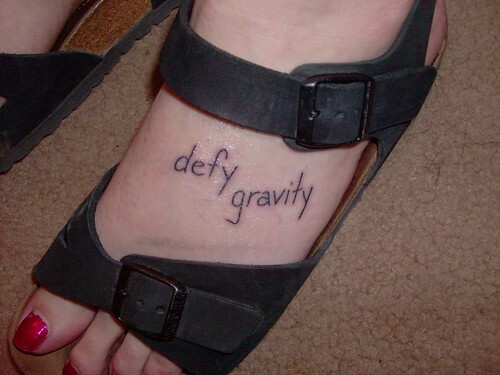 I’m not sure about tattoos on the foot…the ankle hurt like hell, but more power to you! I love dragonfly’s. I have been trying to decide on a tattoo forever. Maybe this will help me decide. Very cool! I always wanted a tatoo, but have never been brave enough to face the needle!